Powers/Abilities/Functions: It was a artfully handmade book bound in leather with a protective spell upon it. When it was opened by someone differently than Merlin, the spell transported the intruder to the past, in the Middle Age, to Merlin himself. (Strange Tales I#71/1) - In the Middle Age Merlin possessed a diary. 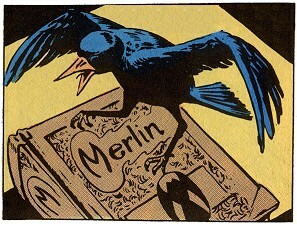 (Strange Tales I#71/1 - BTS) - As protection of the diary's content, Merlin placed an enchantment on the book. (Strange Tales I#71/1) - The diary accompanied Merlin to the modern era when Merlin posed as an old antiquarian in a little town in the Balkans. He kept his almost forgotten diary among other arcane objects. An American tourist, who did not believe in mystic arts, visited Merlin's curio shop. Despising the statues and antiquities there until he found the diary. In spite of the old man's warnings, the tourist opened it, triggering the protective spell. The man was transported to the past by the enchantment of the book. When he returned to the present time, the man saw the power of black magic as his hair had become white. Comments: Created by unknown writer and Steve Ditko (pencils and inks). 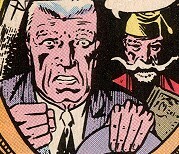 The Balkans, Merlin and an enchanted book are all elements found later in Ditko's DC Demon's story against Baron Tyme searching for Merlin's spellbook. or any other "diary" or enchanted book..